6 must-see places in the Balearic Islands for sailors 1. La seu cathedral in palma de mallorca is a must-see from the outside and from the inside. Beautiful in the daylight as well as at night. 2. Cabrera archipelago national park, where you can anchor a yacht, go snorkeling in azure water with hundreds of fish or go hiking on beautiful trails on the island. 3. Sa calobra bay located at the foot of the 8 kilometer long gorge torrent de pareis. 4. The es vedra rock, where sirens tried to lure odysseus with their singing. 5. Espalmador with turquoise water and beautiful sandy beaches. You can only get there by a boat. 6. Ibiza by night. 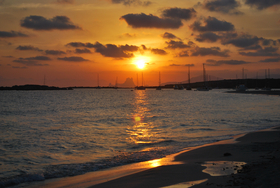 Ibiza is known for its vibrant nightlife, where parties last till dawn. Charter a yacht and explore Balearic Islands by yourself! 1. The weather in the Caribbean is great for sailing With temperatures around 30-35°C and permanent winds 5-6 B 2. Hurricane season runs from June to the end of October 3. Ocean waves may rock your sailboat a lot 4. Catamarans are superior while anchoring in the bays 5. Martinique is a convenient starting point due to its good air connections. 6. Most of the islands belong to different states so remember to check in 7. It’s the IALA B region so the colours of the buoys are exactly opposite than in Europe (Caribbean = green buoy on the left, red on the right at the entrance) 8. We do not recommend sailing around the islands at night due to rocks and reefs 9. Pay attention to fresh water sources while planning your cruise route 10. Do not trust your electronic maps endlessly… 11. Bonus: respect nature of the Caribbean See you in the Caribbean! Hints for skippers sailing in Croatia. Tips for those that charter yachts in Croatia and want to sail safety. TIP 1: Do not sail during the Bora wind, its blasts can be up to 10B. TIP 2: VHF License is obligatory to sail in Croatia, make sure you have it. TIP 3: Consider insuring the deposit, so that you don't risk loosing it in full. TIP 4: Red is on the left and green is on the right when entering marina. TIP 5: Majority of sailboats cannot sail under Zdrelac bridge. TIP 6: You can check weather forecast on: meteohr. TIP 7: On each yacht you have Internet WiFi (standard or paid). TIP 8: you can snorkel around the yacht without any limits... TIP 9: ...but you must buy permission for diving in Croatian waters (15 EUR). TIP 10: Plotter GPS in cockpit will ease your navigation in narrow spaces. Where to sail next time? Watch our Sailing Inspiration about Cyclades (Greece), where in 2-week cruise you can visit: Santorini, Mykonos, Delos, Kleftiko, Amorgos, Milos. Enjoy stunning views and uncrowded anchorages. Remember: In July and August in the Cyclades can blow strong wind - Meltemi. Meltemi blows up to 8B, lasts up to 7 days and is for experienced sailors only. In case of MELTEMI hide in marina. Marinas in the Cyclades aren't very expensive. Then go to the nearest restaurant and enjoy Greek salad or other local food! Athens: main starting point - has great flight connections with the whole Europe. You can start cruise also from Lavrion port, which is closer to Cyclades. Lavrion is just as far away from Athenian Airport as marina in Athens.